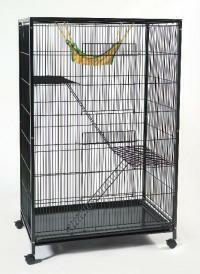 This spacious Tower cage is suitable for many diffrent types of pets. It comes included complete with a hammock, ladders, two different platform levels and a pull out tray for easy cleaning. The cage is mounted on castors so can be moved around with ease, there are two large doors also. A beautifully constructed large cage suitable for rats, chinchillas, ferrets and other similar small animals also with the ability to hold more than one. Bar spacing is 16mm.